Are you looking for a safe and affordable way to transport a large group? 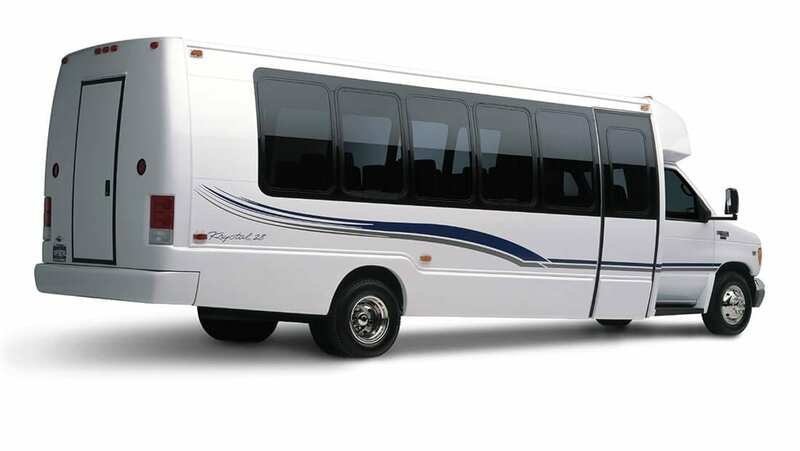 Austin Charter Services offers reliable passenger bus transportation to customers in the Austin area. Whether you’re taking a group of people to a wedding or needing to get your group to the airport, our licensed charter services can get you there. Wherever you’re going, we can get you there. Our luxury coach buses were designed with your comfort in mind. If you have a special request, let us know! We’ll do our best to accommodate your needs. Why Choose Austin Charter Services? Our experience in the passenger bus rental business spans many years making customers happy. We’ve dealt with many difficult situations and have always done our best to handle unexpected events with professionalism. We offer our customers a wide-range of passenger buses to choose from in order to accommodate their small or large group. Are you looking for a luxury passenger bus to get you to a special event? Do you want to organize a sightseeing trip with a large group of people? At Austin Charter Services, we provide the best charter bus services available to our customers. We understand that you need a safe, luxury motorcoach to transport you and your group to and from your destination, rely on our transport services to keep you safe and comfortably. Contact us today to learn more! Our organization used this company to take 250 kids from Austin to a weekend retreat/camp in New Braunfels. While booking we appreciated the timely response when we had a questions. Austin Charter Services made sure that our contact had the lead bus driver's phone number before our bus departure time. This charter company left us to believe that they really cared to make it a smooth trip for us and great experience using their buses and drivers! My husband and I used Austin Charter Services to shuttle our out of town guests from downtown Austin to our wedding in Dripping Springs and back. They were flexible and reliable; we changed the pick up time on the day of for an hour before without any kind of hassle. It was overall a very positive experience and we are very grateful for the service they provided. Great business! Excellent service! I was able to book buses for an event 2 days beforehand and still got a great deal. The drivers were very polite and timely. Austin Charter Services made sure I had the bus drivers' numbers before the event, and they picked us up on time. It was definitely a hassle-free experience, and I would certainly use this company again. We had the same bus company shuttle patrons to our event for over ten years. Just weeks before the event I found out that that bus company went out of business. I contacted Austin Charter and they came through great. Nobody even realized we had switched companies. I heard no complaints the whole weekend and the greatest compliment you can give to this kind of company is "the buses ran on time". They quickly returned every phone call and followed through on the big day w/o a doubt! I was very pleased with the service provided from Austin Charter Services. I was looking for buses for my wedding, and given that it was during prom season, had a lot of trouble with rude, overpriced companies. rnrnAustin Charter Services came through with excellent, quick, and cost-effective service! My guests were well taken care of and had a blast! Austin Charter Services was a great choice for our transport needs. They arrived ahead of schedule and were friendly and prompt about getting us where we needed to be. We did not encounter any problems and I would recommend this company to anyone else looking to rent a bus service. The owner of the company was very nice, flexible, and helpful. He was able to get something booked for me short notice and even came to my apartment to pick up the money. The driver arrived early and was very friendly and helpful as well. GREAT experience. Would recommend to anyone! We used Austin Charter Services last minute to take us out to float the river. They were able to set something up at the last minute and the price was great! Our bus driver was very friendly and accomodating and everyone had a good time. It was worry and hassle free and I would recommend them to anyone! Our group of 10 used Austin Charter Services for a full day of events around Austin, and we could not have been more pleased. The company (Diana was our contact) timely responded to each request, and we made several changes to the schedule before the day of the trip. Communication was always prompt and courteous. This carried over to the day of the trip, when our driver (Natalie) was on time (early, acutally) and available by cell throughout the day in case we needed to stay longer or shorter in any destination. Even though it was a very hot day, Natalie was unfailingly polite and helpful. I cannot say enough nice things -- it was truly superior service at a very reasonable price! Our group of about 30 people worked with Austin Charter Services to arrange transportation to a place about 45 outside of Austin. They were incredibly easy to work with and very responsive through the booking process. The driver was early and very friendly/accommodating, and the bus was great! Unbeatable price for a quick trip like we had. I would definitely recommend them to anyone planning a weekend in Austin and needing transportation. Thanks again! We rented a school bus from Austin Charter to take a party of around 40 from Downtown Austin out to the Salt Lick. The bus services was punctual and accommodated all of our requests for additional stops. The bus was clean, driver was friendly, and allowed us to play some music and drink a few beers on the ride. Prices are very reasonable. We had a great night and would recommend using Austin Charter Services. We hosted a wedding at Vintage Villas over Lake Travis but wanted our guests to stay downtown at the Radisson to enjoy the nightlife Austin has to offer. We were on a very tight timeline to work around hotel check-in, ceremony start time, and within the 8 hour minimum bus rental time-block. And Austin Charter Services pulled it off beautifully. Everyone was on-time and Emilio our driver was very easy to communicate with and very accommodating to our requests. You also cannot beat the price these guys can work you up. You can get as fancy as you want depending on your budget but if you need something more economic then they can set you up there as well. Most high recommendations for these guys! We used Austin Charter Services to bring our guests from the hotel to our wedding venue on Friday, March 2, 2012. I looked around at about 6 different companies, and Austin Charter's prices were considerably lower than the other transportation companies. Diana was extremely friendly and easy to work with and the driver was great too! The bus was clean, they were on time (early actually! ),and immediately sent the deposit check back after our event. I would absolutely recommend them and use them again for another event! I contacted Austin Charter Services to help drive the employees of Wheatsville Co-Op to our new store location! Abdul worked with me through the whole process, from working with our budget, figuring out how many buses we would need, all without even knowing the destination (it was a surprise)! The drivers were super friendly, as well. I would definitely recommend these guys for any trip that you're planning! We used Austin Charter to rent an awesome white school bus for our wedding party to go float the river a few days before our wedding. I was able to send all the details to the company via email with no problems and their rates were very competitive compared to other companies. Emilio, our driver, was wonderful, very friendly, and able to roll with the punches as our plans changed a few times on the day of the trip. We were very lucky to get Austin Charter and Emilio and would certainly recommend them to others in the future. Thanks so much! We used Austin Charter to shuttle guests between our church and reception hall on the day of our wedding. The blue transit buses they use are funky and cool looking. Perfect for a medium or short drive. The owners are also friendly and professional. Plus, going with a local small business helped us save so much more than we expected!! Absolutely wonderful to work with. I was able to make a reservation for a school bus a week before graduation weekend which was awesome. Abdul is the person I talked to the entire time and always managed to answer my calls and annoying questions. He was really nice and was willing to work with me when I asked him if the bus could come 15 minutes early because I was nervous about getting to our destination on time. He sent me a contract which listed all the details, and notified me that there is a $150 refundable deposit that I would have to pay only if someone spilled a drink and/or vomited inside the bus. He let me know the bus driver's name and her number so that if I had any questions I could contact her. He immediately mailed me the $150 check after the weekend was over - I didn't even have to ask! (Even though I did...but he had already sent it.) I would highly recommend going through Abdul and Austin Charter Services! After checking on so many companies, I decided to go with Austin Charter Service and it was the right choice!! Why? First impression is always a very important one. I called few others and the responds I got were like they were busy and so on and they were much more expensive with a fixed rate. Austin Charter was the only one that offer the flexibility for me and gave me quotes and responses in a very prompt and friendly manner. After all, when you book something for your event, you don't want anyone to get you worry or upset on your important day. Very reasonable price and also, it was great choice to get the charter service because our wedding guests were from oversea, they didn't need to worry how to get to our venue. The guests were also worry free on the alcohol consumption during such an event. Thank you Abdul for organizing in such a short notice too!! We chose Austin Charter for our wedding shuttle services. We needed our guests brought to the wedding venue and back to the hotel at the end of the night. The shuttle bus was huge and the driver was very friendly. Abdul at Austin Charter offered us a great hourly rate that was better than any other company I contacted. After the wedding Abdul also helped us track down a guest's lost cell phone. This is the perfect company if you are looking for a basic shuttle bus and don't want to spend a fortune. Austin Charter Services came recommended by our friends because of their low rates and friendly service. We rented a transit bus (the most affordable option mid-day,mid-week) through Abdul, who responds quickly and politely. Because of the weather, our event was cancelled 45 minutes before our scheduled pickup time. Both the driver and Abdul were easy to reach, extremely understanding, and offered a full refund without any hassle. I hope to have another opportunity to work with ACS, and will continue to praise their upstanding business. The bus company arrived on-time and ready to go with plenty of room and air conditioning. Our bus driver, Gloria, had a very positive attitude and was extremely accomodating. We went to float the river at Don's Fish Camp, and she got us there quickly and was happy to accomodate our needs once we got there. She was at the site when we finished the float and got us home quickly. We also got our deposit back! It was also really easy to book the bus and they quickly responded to any questions I had. Everything worked smoothly for our charter with Austin Charter Services. We took a rowdy crowd from downtown austin to a party boat in lake travis and came back downtown. The bus driver did a great job of getting us around safely and on time. Would highly recommend this company for your bus needs near Austin. I used Austin Charter for two nights in June 2014. We had two buses for a Friday night Rehearsal Dinner, and two buses for the wedding the next night. Around 100 people to transport. They did a SUPERB job. They were on-time, buses were clean, drivers were friendly. We had a problem (our end) where some guests weren't ready to leave as scheduled, and the drivers worked with us to handle it. They held a bus late just for the partiers! I will use them any time I need service in Austin. Austin Charter Service did a great job providing transporation for my wedding party and guests this summer. Abdul was easy to work with from start to finish. He was quick to respond and provide pricing upon initially contacting him. The day of the wedding the shuttle to pick up the wedding party and groom arrived early and was ready to go. The shuttles for all of the guests arrived on time and ran through the night as planned. They even helped the couple of days after the wedding as we tracked down items that were left on the buses. They provided me the best pricing and their service met my expectation of wanting to provide all of our guests comfortable and reliable transporation. I would recommend them to someone looking for group transportation. We were very pleased and thankful for the shuttle transportation that Austin Charter Services provided for us. We used them 5 days a week for 10 weeks this summer. Their drivers were safe, kind and reliable. Over those 50 days of service, they were only late by a few minutes a handful of times and they called to let us know so we were not waiting in the dark. Most of the time they were here 15 minutes early waiting on us to load. We'd use them again and would highly recommend them to anyone else! We had an amazing experience using Austin Charter Services to shuttle guests on our wedding day! Austin Charter services provided the transportation for my daughter's wedding just recently. We chartered for 3 busses and one sedan. Abdul was great to work with, easy to reach by phone, and handled special requests with ease. When we canceled 1 of the busses the week of the event, he didn't even charge us! The drivers showed up on time and were courteous and professional. I highly recommend this company! My Son's wedding was scheduled at a nice venue about 25 miles out south of downtown Austin. Seventy-five plus guests needed to be transported from the Downtown Radisson Hotel to the venue for a 5:0 PM wedding and reception. I contacted several Charter Companys since I was responsible to get the guests there and back safely. Austin Charter was the most responsive to my requests and more prompt in communicating with me. The Austin Charter Sales Representative answered all my questions and submitted a very competitive bid. The contract agreement, schedule, route, and driver information were all handled via e-mail. Austin Charter Service coordinated everything with the Hotel and Venue and made my life worry free and easy. The buses were on schedule and the guests were delivered and returned with only praise for the drivers and the company. I would recommend Austin Charter Services to anyone needing transportation services in the Austin area. "I want to thank you again for being so professional and working with our school on our recent trip to the Texas Renaissance Festival. This is our second year to use your charter company and we appreciate the quality of the ride at excellent price. I would encourage other schools to use your charter company. It is an excellent service for a reasonable price." "Austin Charter Services has been a great partner for our campuses this year. We always appreciate your preparation for each trip from communication ahead of time to considering on-the-spot route adjustments to ensure our trips always run smoothly. You and your drivers are professional, kind, and community-oriented. Thank you!" Thank you for partnering with us to make monthly field trips a possibility for our students by offering us affordable rates. You always go above and beyond in your level of reliability and communication; I know that I can count on you and your drivers to be on time, well-informed of the routes, and to exercise safety on the road. Many thanks! I've been very pleased with your attention and service from the beginning. We got to San Antonio in plenty of time. Your bus was appropriate for our needs, very comfortable, and your driver served us perfectly. I must rate your service a big 5! Thanks so much and expect me to call on you next year. Are you looking for group transportation in Austin? We have your solutions!